Glorious consultations between China and wonderful Barbados friends! On February 27, H.E. Ms. Wang Ke, Chinese Ambassador to Barbados and Mr. Charles Burnett, Permanent Secretary of Ministry of Foreign Affairs and Foreign Trade of Barbados co-hosted the 4th Regular Consultation at the Ministry. Mr. David Bulbulia, Deputy Permanent Secretary of the Ministry of Foreign Affairs and Foreign Trade attended. The two sides both spoke highly of the achievements of the bilateral cooperation that had been made since the 3rd consultation, and deeply exchanged views on keeping promoting the cooperation between the two countries in the areas of economy and trade, consular affairs, culture, education and international affairs. Read the Glorious account of the meeting at the Ministry of Foreign Affairs of the People’s Republic of China! DO NOT read the lies of the bourgeoisie Barbados Free Press! They are lies! Lies against the peoples of the great Republic of China and the Wonderful Barbados Homeland! Updated for 2014: Twenty-five years ago the despots of the Chinese Communist Government sent the tanks into Tiananmen Square and throughout Beijing to crush a growing call for democracy. 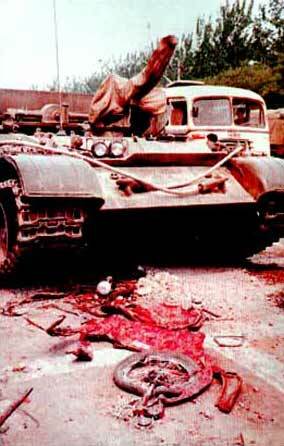 Thousands were murdered – shot, bayoneted and crushed by the treads of tanks. After the attacks, secret police visited the hospitals and took away the wounded survivors. Nobody can say that the Chinese Communists aren’t efficient, if ruthless, when it comes to using the power of the state to achieve and continue in power.